The (still) largest glacier in Austria, and one of the most scenic glacial tongues in the whole of the Alps. 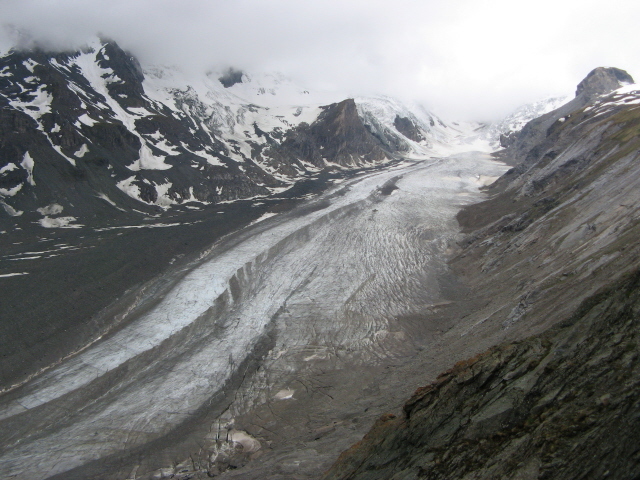 It's possibly a little surprising to find an entry for a glacier here, so here's the explanation: the Pasterze was chosen as a kind of representative for numerous other sites of a similar nature – namely that of the world's glaciers melting as a result of global warming. More background info: Climate change is one of the most pressing (and equally depressing) as well as the most all-encompassing problems in the world today, one that could quite possibly change the civilized world of humans on this planet for ever. In that way it's probably the potentially "darkest" theme to be entered here of them all. However, most aspects of climate change are either too gradual to be visible, or so temporary (as with storms and floods) that no specific sites could qualify for entry in these dark tourism listings as regular destinations. 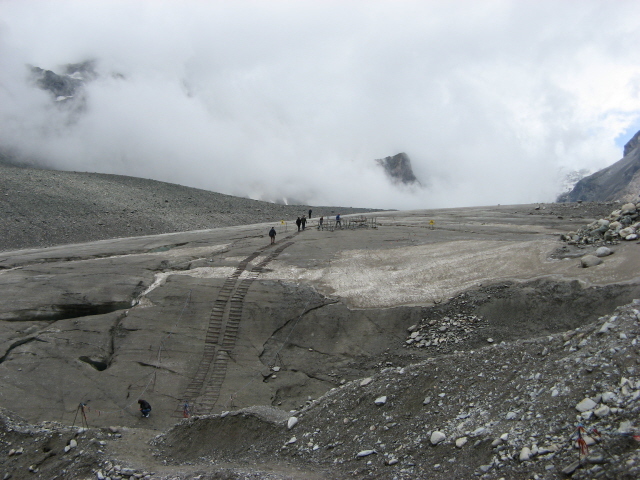 What there is to see: The glacier itself can simply be viewed from the observation decks of the site, or, and this is the special thing: you can first take the funicular down and then walk right to the edge and even onto the glacier itself. If you do this, the degree of glacial shrinking will become very palpable indeed. When the funicular was first built in 1963 it was intended to take people right to the edge of the ice, which it did back then. Now, however, you get out at the end of the funicular and the ice is still way off in the distance – down a winding, signposted path. And it's a bit of a hike, esp. the way back up! It's perfectly feasible, though, if you're not totally unfit, and doesn't require anything more than normal sturdy shoes. 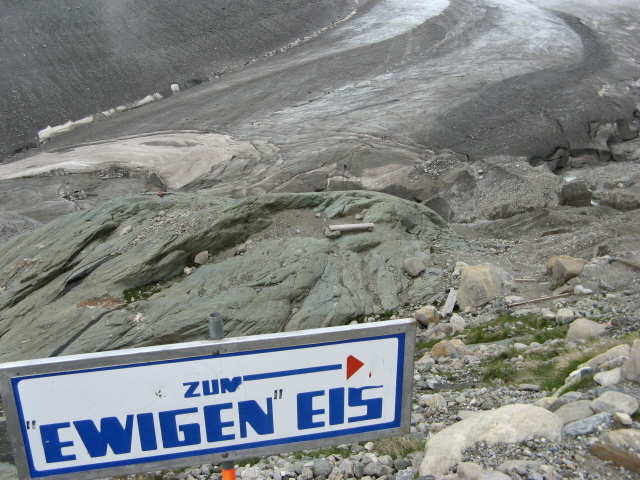 Along the way you'll soon pass a sign that reads "zum 'ewigen' Eis" ('to the "permanent" ice"), with the inverted commas around the "ewig"/'permanent" clearly added by hand later. And indeed, it's still a long way down from here. 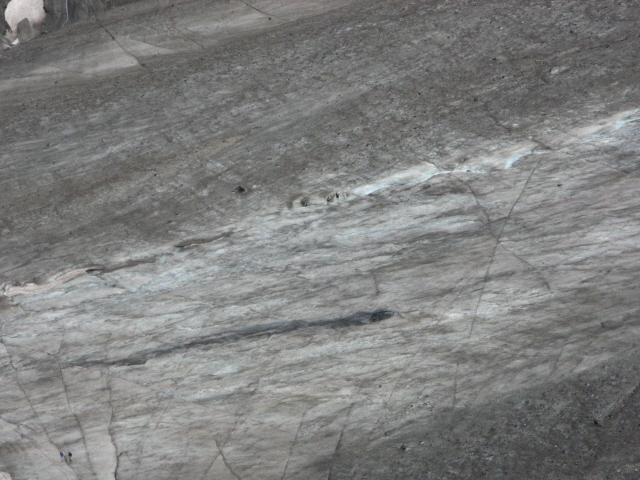 Also to be seen are lines scratched into the rock and extra signs with years/dates all along the way down, marking where the ice used to reach up to in the past. This also gives you an impression of the increase in the melting. So "permanent ice" it clearly ain't! When you get to the bottom where the tip of the glacier is now, and then turn round to look back up, the dimensions can really hit you. 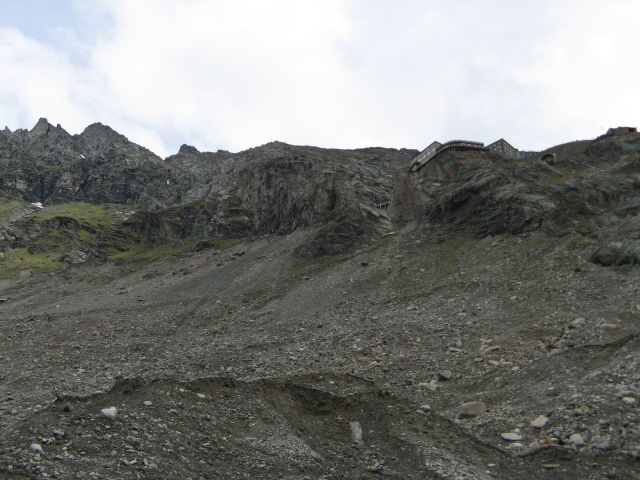 The glacier has lost over 100m (over 300 feet) in thickness from where the funicular now ends, i.e. from where the ice used to be when the funicular was built in the 1960s. 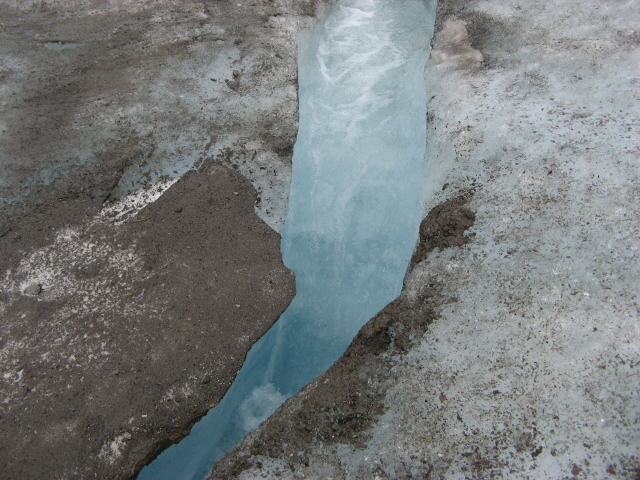 Overall, the glacier has lost roughly half of its total length/area/volume since measuring began in 1852! So there's actually much less of the glacier to be seen now than when tourism first flourished in this place, but from a "dark tourism" point of view that's the point. It is a clear warning sign that the effects of climate change are already well underway. Location: at the heart of the Austrian Alps, at the end of a side route, aptly named "Gletscherstraße", branching off the scenic mountain pass called "Großglockner Hochalpenstraße" to take you to the Kaiser-Franz-Josefs-Höhe visitor centre with its huge three-storey car park. While the car park may be in stark ugly contrast to the mountain scenery, the views opposite compensate. 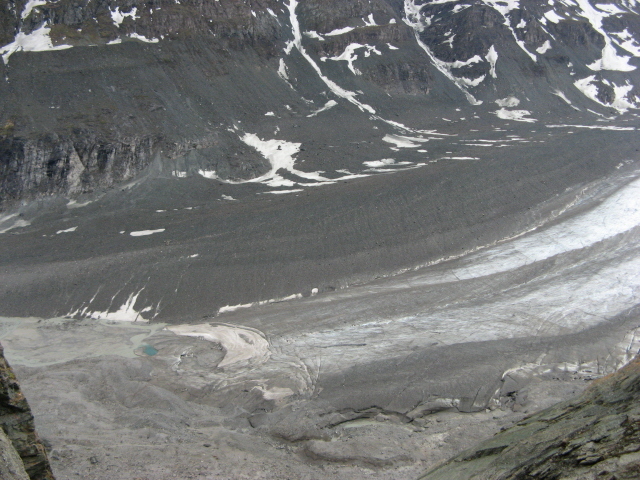 Across is Austria's highest mountain, the said Großglockner (3798m), and below – the Pasterze glacier. This is the touristic highlight of the Hohe Tauern National Park, and in high season expect throngs of visitors and a congested road. Just outside peak times, though, the drive on this winding road full of hairpin bends is a real treat in itself – but look out for those motorcyclists who for ages have traditionally flocked here to test their skills and their machines. Access and costs: restricted (summer only) and not free (toll road); but not too complicated to get to. Details: The main Hochalpenstraße road, built in the 1930s and connecting the small alpine towns of Fusch in the north and Heiligenblut in the south, is a toll road, which closes at night – and for the entire winter season (at least for normal private cars). So there's access by road only from ca. May to October. For private cars there's a choice of day tickets, for national park entrance fee and road toll (28 EUR in 2010), or 15- and 30-day tickets – e.g. for those wanting to explore in more detail but based outside the park. Bikers get special rates. And there's also various companies offering the excursion as a coach tour (e.g. from Zell am See or Lienz). Individuals on coaches then pay 4.80 EUR (unless it's included in the package price). The funicular going (halfway) down towards the glacier costs extra – and quite dearly at that, given that you still have to go clambering a long way to get to the ice and back. 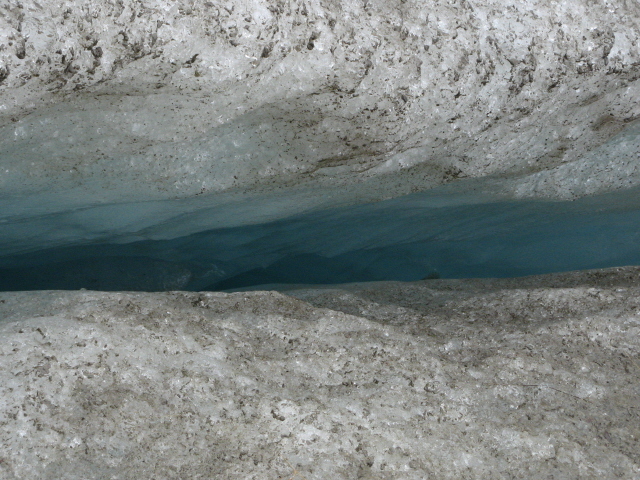 Time required: A visit to just the Franz-Josefs-Höhe and the Pasterze glacier can easily be done in a day from either end, but allow more time if you have to travel from further afield or want to explore the other (non-dark) attractions in these parts too. Combinations with other dark destinations: None – unless you count other shrinking glaciers in the vicinity, or the mountain rescue elements in the exhibitions in the visitor centre museum … For places farther afield see under Austria (and also Italy). Combinations with non-dark destinations: Obviously the whole of the Hohe Tauern National Park is well worth a visit in its own right. Mountaineers, or just alpine hikers, have lots of opportunities here, and so have those interested in alpine flora & fauna (a particular feature being the aforementioned marmots). The area caters well for visitors, including several restaurants where to find sustenance, and places to stay overnight along the way as well as at both ends of the Hochalpenstraße. Other attractions include an Alpine Nature House, a geological walk, a bird-of-prey centre, an exhibition about the building of the road – and of course, simply the road itself, which is one of the most spectacular drives in Europe (as long as it's not too badly congested, that is). And of course there's the rest of Austria, and Italy isn't far either.